It can be hard at times to find decent art supply stores in and around Brisbane. 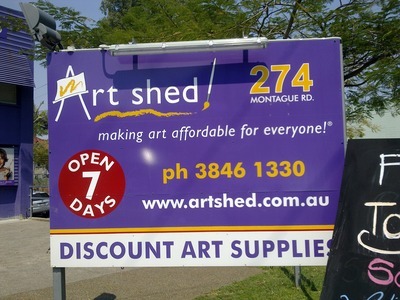 Unlike many art stores which trend towards paper and other crafts, Art Shed Brisbane focuses on the love of art, passion, and inspiration. Whatever you're in the market for you're likely to find it at Art Shed. Canvases and canvas making supplies, two aisles of paintbrushes divided by medium, various printing and sculpting supplies, paper, paint, ink, pastels, pens, and so much more are on display. If you get a bit overwhelmed in store and forget something, they also have a website where you can shop online. On top of the vast array of supplies, Art Shed also offers a materials testing section known as the "Art Kitchen", regular and free art demonstrations, and Tuesday night life drawing classes. This is the most comprehensive, inspirational and supportive art supply store I have found so far in Brisbane and the surrounding areas. If you are a dedicated artist, interested in learning a new skill or technique, or just in need of something fun to do this summer, hit up Art Shed. Where's the Best Late Night Dining Restaurant in Brisbane?